Easy Panel Cafe Barrier System - 2 Metre PACK includes printed banner, frame & edging. Signs and banners are available for Melbourne, Sydney Brisbane Adelaide and all cities and regions of Australia. From our large central warehouse and factory, we manufacture and ship advertising signage products to business, events and shops all over Australia twice per day. Description Cafe Barrier Frame with high quality banner printing with special edges included. Adjustable lower rail for 'smart tensioning' included. Also includes (2) rotational feet and FREE weight bag and tightening tool. Special moulding allows customers to quickly refit new graphics. Universal Fit: Includes moulded tracking that allows Keder or 5mm Rope seamed edges to be used by normal signwriters and printers. Shipping: Shipped flat pack carton. Minimum assembly required. Tool included. Extra wide stabilising feet and swivel position makes your frame extra sturdy. Any Graphic, Any Time... 'Smart Tension' by Easy Panel makes refitting your graphic easy. All new kits are supplied with a tool to adjust and refit your new banners. The most popular size cafe banner sign frame size with sliding banner is used Australia wide. Perfect for cafe restaurant hotel owners to advertise and create a temporary eating dining area. Cafe barrier with sign attached, the special slide track allow the banner sign to slide in easily. Ideal for cheap promotions and advertising. Easy to assemble, tool included. Packed for economy delivery. Engineered signage systems by QuickSmart are famous for quality. 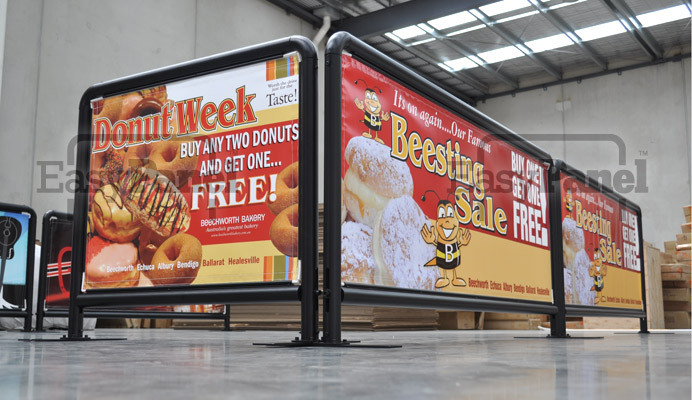 Outdoor dining sections and barricades for seating areas now become a powerful advertising sign that is quick to update with new promotions. Changing over the graphic is simple and gives you the opportunity to advertise more often. Bar & Restaurant eating area signs and advertising for outdoor decks etc. Make your deck or outdoor eating area attractive and modern with fresh designs. The 'Smart Tensioning' system and curved slide track allows you to use single or double sided printing on your banners. Quickly pull down the lower rail to keep your banner sign perfectly tensioned. Special blockout vinyls, mesh and ultra smooth vinyls and even traditional canvas signs call all be used inside the frame. The special curved slide track allows 6mm seaming to be used. With the options of using new modern sign making flexibles, you can print direct to fabric or screenprint. Placing two or more Easy Panels together to form a section or area for dining, queing, blocking etc is easy. Perfect for mall and shopping centre, outside your door and ideal for footpath and street side. The easiness of being able to change over graphics, update your advertising and lower costs all make it easy for you. Combinations and boundaries are easy to create. The perfect size of 1m and 2m options gives you great flexibility to suit the width of your area. Buy multi pack sets for the perfect boundary. Cafe barriers lined up to make your food business come alive. Easy to store caffe signs, takes up minimum overnight room. Lightweight makes setting up your store in a few minutes simple. Under all Australian OH&S weight guides. See above. Each unit includes a FREE weight bag. Limited time offer. Also available: Supplied in bulk lots with plywood cases or individual with cardboard cartons. Close up of special edging supplied when you order AdBanners. Also, you can use any normal banner sign with rope seaming. Question: Can my normal sign company reprint the banners? Answer: Yes, we have designed the caffe banner barrier system for any signwriting company to help you reprint new graphics and banners. Once you purchase the Easy Panel Frames, you can update alter and refresh your banners using any quality sign company. The special track slide design is universal size fit. Your signwriting company can use standard rope banners too! Ideally suited for unique outdoor environments and increasing your seating area and revenue opportunity with these cafe banner barriers and windbreaks. 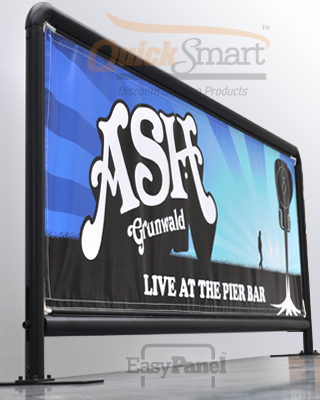 This new caf� banner solution is perfect for cordoning caf� and restaurant seating and smoking areas while providing a means of advertising that is simple to change over and allows you to market different seasons and events easily. Ad windbreaks are an ideal and cost effective way to set an outside eating, drinking or smoking area for your bar, restaurant or entertainment area and attract additional customers and give you the edge over your competition.